Designer-requested blends are in the spotlight of the five new metallic thread colors from Kreinik. Now available in Fine #8 Braid size (plus #12 Braid) are two cheerful lime green shades: 5801 Cool Cucumber has a touch of blue, while 5802 Leap Frog is a pearly lime. Then we filled in some of our color families with various hues: color 5803 Seaside blends pretty purple and pearl. Colors 5800 Golden Blackberry and 5804 Calypso (a rich orange) feature a golden shimmer thanks to the addition of gold to the base fiber. Calypso would add a level of elegance to Halloween and autumn designs, while Golden Blackberry covers many design themes. Use Kreinik #8 Braid in needlepoint on 18 mesh canvas, and as a blending thread on larger canvases. In cross stitch, Fine #8 Braid is about the weight of two strands of embroidery floss, which means it gives perfect coverage on 14-count Aida. It is also good when used over two threads on 28-count linens. 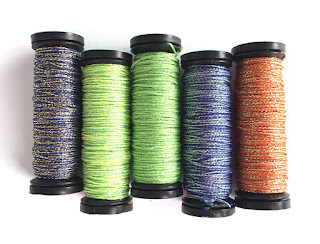 Kreinik Braids are proudly made in the USA, in our Parkersburg, West Virginia, factory. All five new colors are ready to be in your stitching repertoire, to bring your next design to colorful life. 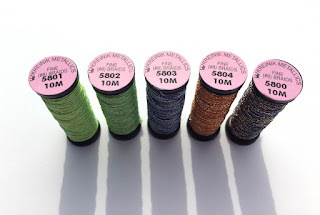 You can find Fine #8 Braid in your favorite needlework store or http://www.kreinik.com/shops/Fine-8-Braid.html. It's a truth universally acknowledged that Kreinik threads make great bugs. Whether you are fly fishing or stitching, a metallic thread beautifully replicates what is shiny in nature. Stitchers can go beyond bugs, however, in using metallics to add realism to a project: use them for the birds AND the bees. "The blue block is the one I made for the wall hanging our Bee donated to the Gulf Coast Bird Observatory: http://www.gcbo.org. It will be auctioned online beginning April 1. I really enjoyed doing it, so I did a smaller bird on my peach block…If you look closely you will see all that beautiful Krenik thread. The motif on the peach block is stitched with the ZTlC 0031 [a Kreinik machine sewing thread]. I absolutely love that thread and have this brown and a bright gold. I've used the 0031 on the brown bird and the 001C fine silver cord on the peach one. The branch has 3 various Krenik cords and ribbon. Of course, many of the seams are Krenik threads as well…They remain my favorite threads by far." Crazy quilting is such a beautiful form of embroidery, and it always inspires us to experiment more with threads and stitches in other mediums like cross stitch and needlepoint. Thanks for sharing these beautiful photos, Barbara! 1. From the Red Heart yarn site: "Eddie the Eagle is a new movie starring Hugh Jackman and Taron Egerton and telling the true story of Michael “Eddie” Edwards (Egerton), a British ski-jumper who succeeds against the odds and with the help of his coach (Jackman) to compete in the 1988 Winter Olympics. Knitting plays a big role in the movie, since Eddie’s mom (played by Jo Hartley) knits and wears a sweater that says “I Am Eddie’s Mom”. KNITTING IN A MOVIE? YES! This is a great opportunity to promote the needlearts. History has shown that when knitting, needlepoint, and other hand arts are featured in a movie, newcomers want to learn about it...leading to growth in our favorite hobbies. 2. Jimmy Beans Wool, the company who initiated the promotion with the movie's producers, is inviting stitchers to create one hat for themselves, and one for a someone else (a young person . . . ). Inside each hat, you're to include a dream label for each wearer to write their own special dream. 3. Our friends at PremiumYarn.com have created an Eddie the Eagle Hat in a kit - featuring Kreinik's new shoelaces in red for stitching the E in the hat. Making something with meaning + for a good cause + promoting knitting and crochet = win win win and fun fun fun.